Students who have set out to find a suitable service for writing their academic paper may have the impression that they are being bullied. Of course, after all, the number of these services is increasing every day and the choice is becoming more difficult. What do students want from them in fact? There is a fundamental basis of certain requirements for such sites. This includes reliability, confidentiality, acceptable prices, convenient deadlines. However, the most substantial issue remains the quality of work for which a student pays. We consider our main mission to provide people with proven resources in all respects. There are hundreds of sites investigated in our luggage, their positive and negative sides are clearly visible to us. 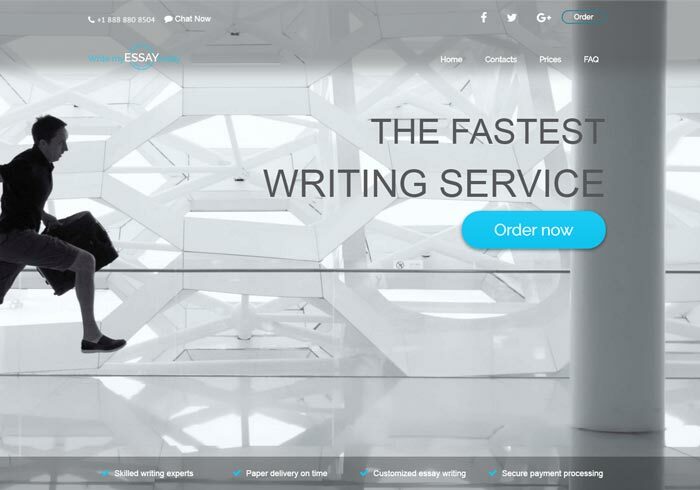 We know how the right academic writing site looks like. And today we will see if Writemyessaytoday.net meets our requirements. There is such a page on the site and this is already encouraging. Here the website paints what information it captures when a simple user comes. Regarding customers, it is only a phone number and an email. No information is transferred to third parties. The only thing that confuses is the absence of information on payment systems, although on the home page the site says that financial transactions are completely safe. Also, information about a mystical “VIP customer service” is present, so, there is some differentiation of customers, but we will consider it below. The site states that all information can be found in “Money back guarantee” document. However, our eye did not catch this section of the site. Moreover, the website team notify that VAT is non-refundable if you live in the European Union, so you must pay it in the process of the payment transaction. All additional options are not compensated too. The refund is possible only for the text of the work. So even if your work does not satisfy you in some way and you legally require the money back, the company will not lose as well. They are proud of their work. Quite good, but not enough. What kind of mysterious academic circles are we talking about? We would not mind getting certain specifics not only about the qualifications of writers but also about their total number and basic skills. Every academic writing site declares the fact that their writers are professionals. So on this point, it is not possible to highlight some special or distinctive features of this site. We return to the notorious “VIP customer service”. The site claims that it has an additional option – a service for VIP clients. Choosing it, you fall into a privileged category: your messages and requests are processed in the first place, you receive all the alerts via SMS. For some people, it may seem like a tempting offer, but taking into account the main audience of the site – students – mixed feelings arise. Students, as a rule, are people who are always short of money and who will look for any convenient way to save it. Sites for assistance in academic papers writing meet students halfway and give them discounts on request. In this light, the proposal to obtain a special status for those people who are able to pay more looks like outright discrimination. After all, it turns out that the request of a student who just asks for a discount or just barely saves money to buy a paper will be done after the request of a VIP client who is just a little more fortunate with money. Companies that provide academic assistance always check the work on plagiarism before sending them to the client. This is included in the basic package of services, and sites always proclaim that their work is not pre-written, but written from scratch. Rather foggy information concerning antiplagiarism is provided by Writemyessaytoday.net. The only thing that is mentioned is that the works are "completely original". But the site is replete with a lot of frightening puzzles about the prohibition to use their work for commercial purposes, render them to third parties, etc. The site has many shortcomings. These guys should not hesitate to clarify them, taking into account the above-mentioned wishes. So, until they improve it, it is better not to apply for their services.